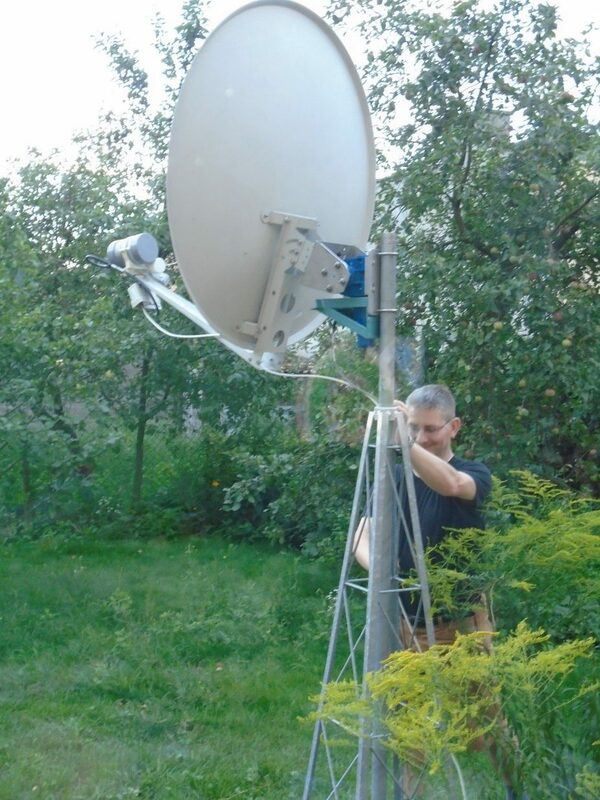 Most HamTV ground stations use a 1.2m dish. With accurate azimuth and elevation tracking, they receive the signal for 5 to 6 minutes during a favorable pass. For ARISS school contacts, 3 or more ground stations, located 800 km to 1000 km from each other along the pass of the ISS, participate to HamTV reception. The Transport Stream produced by the Minitioune software is sent over the Internet to a server, where the incoming time-stamped packets are sorted. The re-built video and audio are made available to the school and the general public. 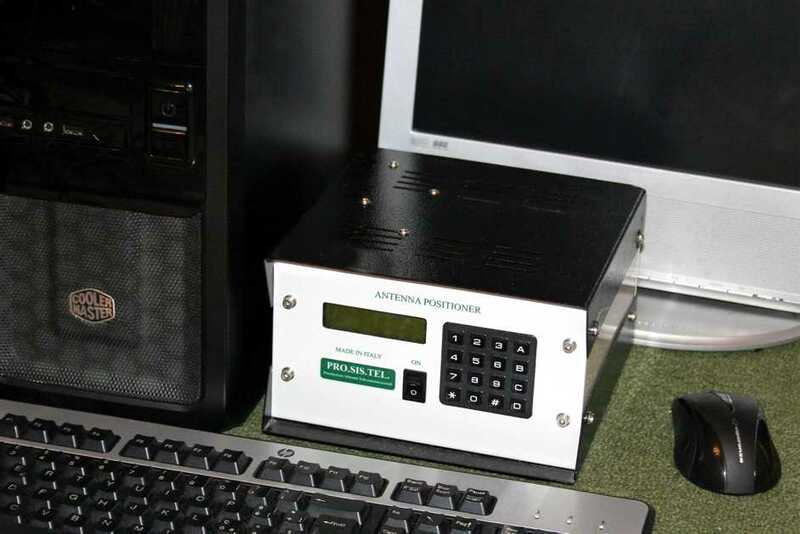 With this setup, 10 to 12 minutes of excellent DATV from the ISS can easily be achieved. With the setup shown here, the azimuth motor is located at the bottom of the quadripod. 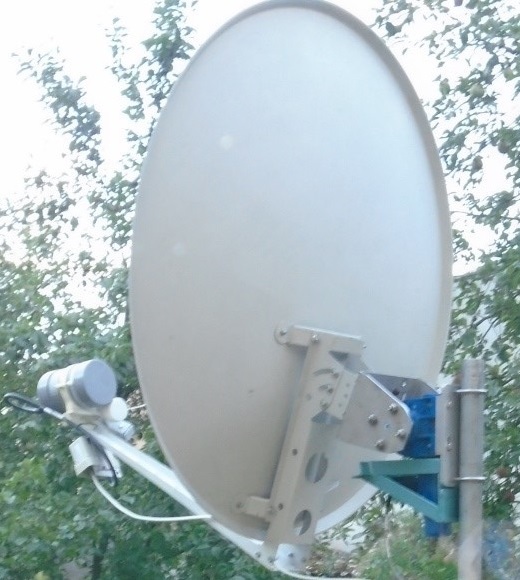 The dish is attached to the elevation motor. 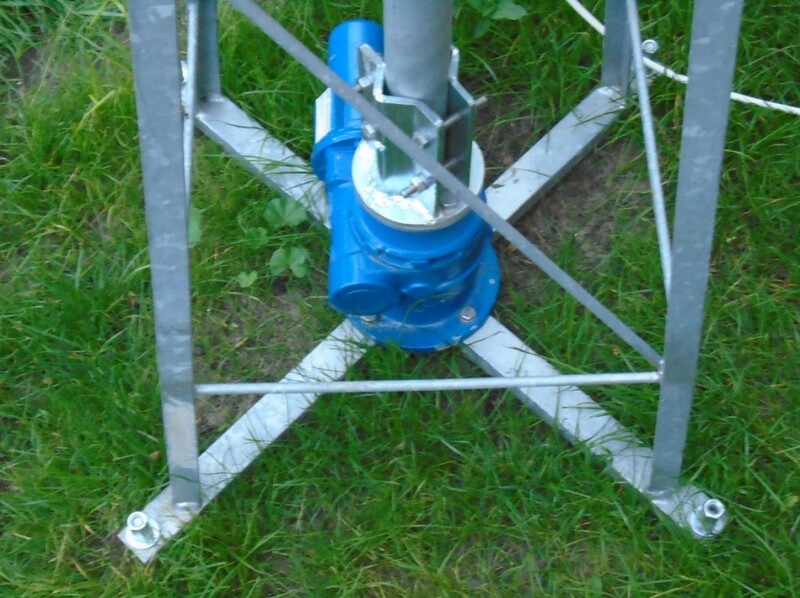 The elevation motor is fixed to a vertical shaft which is rotated by the azimuth motor. Elevation motor (blue) supporting the dishThe green element is a mechanical stop. It protects against damage in a case the elevation would drop below the horizon. It was made by SQ3JVX and SP3QFE. The steerable dish shown here is a Prosistel product. Steel rods are anchored in the soil to support the quadripodConcrete was poured in the pit, almost to the edge, assuring excellent stability. Receiving S-band signals from the ISS calls for high precision tracking. First of all, the aerial structure shall be perfectly vertical and stable. 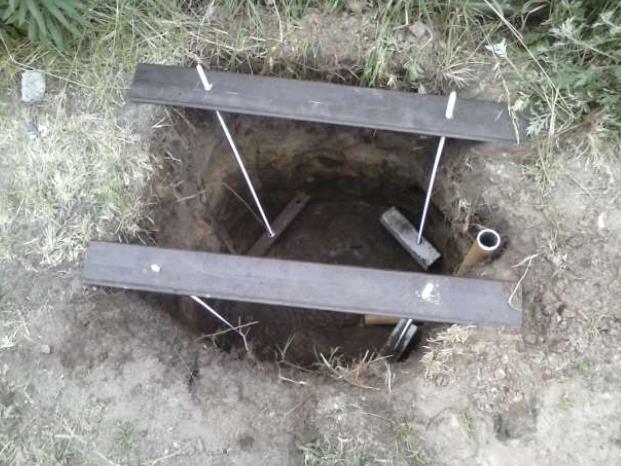 Therefore, the quadripod is fixed on four 1 meter long steel rods, embedded in concrete and anchored deep in the soil. Nuts and counter nuts on the threaded rods allow precise positioning. High precision tracking supposes accurate AZ-EL calibration. This can be achieved easily by measuring the sun noise. Special software is available for this purpose. Please see Noise Power Measurement tool.